Model and actress continues to take part in provocative photoshoots. 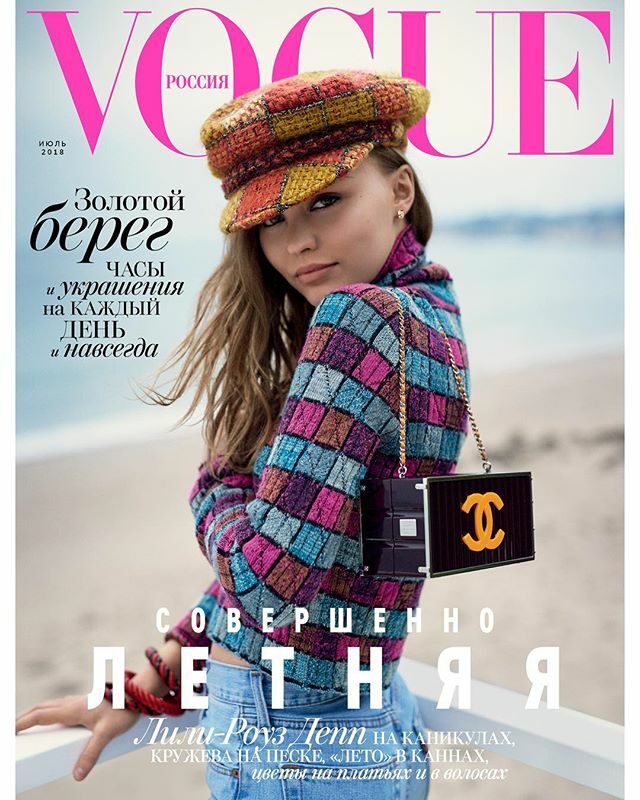 The Russian edition of Vogue magazine published a photo shoot with the participation of 19-year-old daughter Johnny Depp and Vanessa Paradis, Lily-Rose. The model and the actress became the heroine of the summer issue. Lily-Rose poses in a bright mini-skirt with jewelry that minimally hide her chest. "From the sea foam: Lily-Rose Depp has inherited, it seems, all the best from her eminent parents: she starres in films on both sides of the Atlantic, participates in the Chanel fashion shows and with enviable ease speaks both French and English. Lily-Rose told Vogue about her style, new projects and the perfect routine of the day", - the publishers wrote on Instagram. Note this Vogue cover was not the first for Lily-Rose. In a new shoot, the daughter of Vanessa Paradis and Johnny Depp gives us that daddy's sharp look, wears high-waisted jeans, a dashing oversized cap, and a Chanel handbag. The cover slogan has a double meaning: "She's completely summer" and "She's an adult" (Russian pun). ​And do you like the unusual appearance of the heiress of the star "Pirates of the Caribbean"? Recall that three weeks ago there was information in the press that Lily Rose will play the French princess in a historical film based on the classical works of Shakespeare "Henry IV" and "Henry V". Partners on the set will be the star of the franchise "Twilight" Robert Pattinson. "The King" also features Timothée Chalamet, Sean Harris, Ben Mendelsohn and Joel Edgerton. The schedule of filming and the release date of the film have not yet been announced. >Note that for Lily-Rose this role can be a good chance to conquer Hollywood Olympus. The 19-year-old daughter of Vanessa Paradis and Johnny Depp first appeared in the movie in 2014. The young actress appeared on the big screen in Kevin Smith's comedy "Tusk", where she played with the daughter of director Harley Quinn. Then Lily Rose and Harley Quinn appeared in another Smith's movie - "Yoga Hosers", where Depp played with her own mother, Vanessa Paradis. After that, there were such pictures as "Planetarium" and "La danseuse". Despite the fact that they did not get any special recognition among the public and the box office success, the roles in these films gave Depp a chance to become a regular at international film festivals.